As part of Final Fantasy XIV's reboot, the game is getting a reworked character creator. 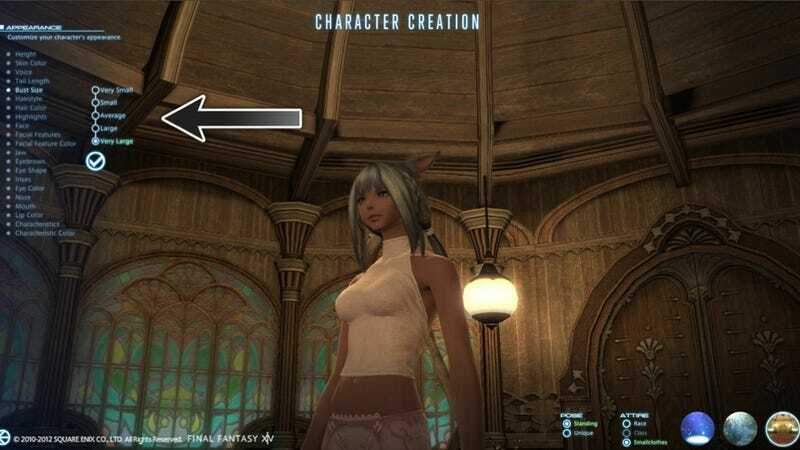 It allows you to customize your character's appearance, such as height, eyebrows, and even jaw and tail length. This recent batch of screenshots (via Siliconera) shows how you can customize your character's bust size: from Very Small to Very Large. It doesn't seem as though you can customize your character's jock size, which seems like it would be only fair! Some might want to run around with a big codpiece. You know, instead of trying to compensate by carrying a big sword.